We are examining the links between structural brain development, language abilities, and reading readiness in preschool-age children. We are currently recruiting healthy children aged 2-5 years, who are a part of the APrON study. Participation in our study will require at least one visit to the Alberta Children's Hospital. The visit will involve a short language assessment and a non-invasive brain scan using magnetic resonance imaging (MRI). You may request an image of your child's brain to take home. During early childhood, cognitive, emotional, social, and behavioral changes happen quickly. Additionally, significant gains in language ability occur and predict future reading success. Language abilities and reading success affect school success, mental health, and career prospects, so effective language interventions are critical to improving long-term outcomes. Understanding the structural brain changes underlying language development in early childhood may help identify critical periods of brain plasticity during which language interventions could be most effective. Magnetic resonance imaging (MRI) is a safe and non-invasive tool that allows us to study in vivo brain development. Thus, our study uses MRI to investigate the relationships between brain structure, language skills, and reading abilities in non-sedated children aged 2.5-6.5 years. Characterize the relationship between language abilities and brain structure in early childhood (2.5-6.5 years). Examine relationships between trajectories of structural brain development from 2.5-6.5 years and reading readiness at age 4.5-6.5 years. 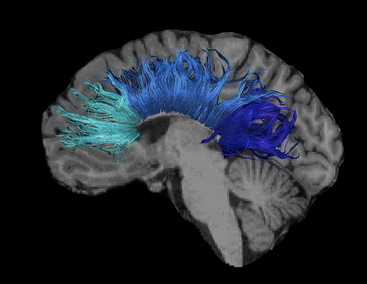 Fig 1: DTI (Diffusion Tensor Imaging) Tractography is a magnetic resonance imaging (MRI) technique that enables us to look at the organization of the brain's white matter by measuring the movement of water molecules, in vivo and non-invasively. 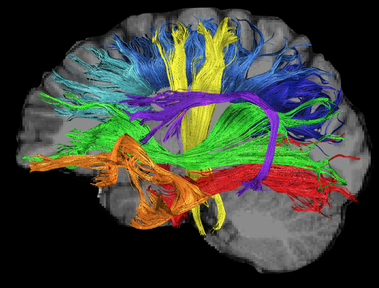 In this figure, white matter fibers within the Corpus Callosum are represented by different shades blue. Fig 2: In this figure the several white matter fiber tracts are represented: the Corpus Callosum fibers in blue; the Uncinate Fasciculus in orange; the Inferior Longitudinal Fasciculus in red; the Inferior Fronto-occipital Fasciculus in green; the Arcuate Fasciculus in purple; and the Corticospinal Tracts in yellow. One optional training visit, during which your child will come to the Alberta Children’s Hospital, meet the research team, practice lying still, and become familiar with the MRI environment. During the training visit your child may also be given a brief language assessment (approximately 20 minutes) and you may be asked to complete a short language questionnaire (approximately 20 minutes). Training visits usually last for 1 hour. Passes for visitor parking will be provided and childcare services may be booked in advance through Emily’s Backyard. One initial scanning visit, during which your child will be asked to undergo an MRI brain scan at the Alberta Children’s Hospital. The scan itself will last between 20-40 mintues. If your child did not attend the training visit, he or she will also be given a brief language assessment (approximately 20 minutes) and you will be asked to complete a short language questionnaire (approximately 20 minutes). Scanning visits usually last between 1-2 hours. Passes for visitor parking will be provided and Emily’s Backyard childcare services may be booked in advance. If the initial scanning visit is a success, your child will be invited to return for follow-up visits. Four follow-up language questionnaires: you will complete one questionnaire every 6 months. You may complete these questionnaires in person, by email, or over the phone with a member of the research team. Each questionnaire takes approximately 20 minutes. Four follow-up scanning visits: your child will come to the Alberta Children’s Hospital for four follow-up scanning visits, during which they will be asked to undergo a brain scan and be given a brief language assessment (approximately 20 minutes). The scan itself will last between 20-40 minutes. You will also be asked to complete a language questionnaire at each scanning visit (in addition to the four other questionnaires). By completing a series of language assessments and brain scans, your child makes it possible for our research to observe changes in brain structure and language abilities over time. Often, changes over time are better indicators of future success than measures at any one particular time point. We hope to use longitudinal data collected over a series of visits to define a trajectory of structural brain maturation from 2.5-6.5 years that predicts a child’s reading readiness at school age (4.5-6.5 years). Thank you for your interest, we will contact you with more information. If you are interested in participating in this study, please use the form below to notify us of your interest.